Another space mission then, huh? I don't remember there being so many, to be honest - maybe my collection (eventually sold by my little brother for some cigarettes, I think) concentrated more on the 'fantasy' and 'fighting' sides of Fighting Fantasy. Anyway, unlike most people who read these kinds of books, in The Rings Of Kether you're out to bust an interplanetary illegal narcotics ring. It seems that despite living in a future where there are anti-gravity devices, robots and moon colonies, people still want to get wasted every now and then - fancy that. There are two endings to this book, and I managed to find my way to one of them with little effort or difficulty to be honest - the fights were few (I had my first scrap about 3/4 of the way through) but not far between - for myself they all came at the end. But they also weren't actually all that difficult - the boss, at least the one I faced, was Skill 10 Stamina 8 - and I had seven stamina-boosting pep pills left - the kind you can pop any time, even mid fight, as this is the future, remember. Each one is like a steak, and gives you six stamina. Awesome. Some other problems with the book were in the presentation - there's no box on the adventure sheet for your ship's 'weapons strength', and upon landing on Kether, I was told my 'spy ray' was confiscated - not that I was told in the introduction that I had one - and the rest of the book assumes I have one. I must've had two, and kept the second from customs. Somehow. Some investigations (in the canteen and the library) led me to a small asteroid, which turned out to be some kind of cult hangout - freaky, but not what I was after. I did come across a strange little poem, which I swear was one of those things I'd need to have read a few paragraphs later, but no. This is the future, all I need to do is blast my way through everything. Or just walk on past, like much of the book seemed to be. 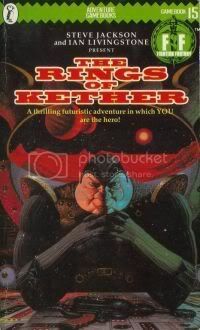 You have quite a lot of freedom to mess about and look around in The Rings Of Kether, and due to the lack of fights, it never quite seems like you're in danger. None of this turn left you win, turn right you die carry-on. I was eventually led to the Isosceles Tower (I wonder what shape it was?) where I discovered the drug runners' hideout was on an island 4000km off the coast, much like drug lords here on Earth, I suppose. I got there to find they had heli-pads and everything, much like drug lords here on Earth, I suppose again. I jumped in some massive vehicle and barged on in, crushing a bunch of guards a la Arnie in The Terminator. Found another dead guy with a stash of pep pills, which was funny considering by this stage I'd not lost a single point of stamina, failed a single skill or luck test or been in a single fight. I soon found the drug factory itself, and according to the book, "There is nobody about, so you busy yourself destroying some of the equipment." Sounds so, err, casual, doesn't it? As if I have nothing better to do! I take some of the drugs as 'evidence' (yeah right) and head on out - only to be confronted by this massive alien with three eyes and a mouth almost bigger than its head. Wow, a fight! Not really - I hiffed my stash into its mouth like a ball into a clown's face at a carnival (what an awkward simile) and it coma-d out, like a true noob. After navigating some Cube-like booby-trapped rooms where I finally got to use up some of my long-stored stamina, I met the 'boss' - 'Blaster' Babbet. What a name. I beat him up, and saved the galaxy from the scourge of what was obviously some killer weed. Not a bad adventure - I liked the sense of freedom, and that clues felt like they could come from anywhere, and even that some were red herrings - especially that following the red herrings didn't necessarily mean the end of your mission either. The downside of this though was that it almost seemed like no matter what you did, you'd eventually solve it. Maybe I got lucky? But even I followed dead ends and answered riddles incorrectly, yet never felt as if I wasn't going to finish the book. I know it sounds silly, considering the subject matter of some of the other books, but it almost seemed like this was far too big a concept to tackle in 400 pages... at least as open as it was. Perhaps a little tightening would've done it better, which is normally the opposite of what most FF books need. But hooray! I won. 5/15. 33%! There are some instant deaths in the book. One of them happens if you take the wrong turning on the cultists' asteroid and haven't read that poem. Another involves having your head smashed in with a paperweight. I actually really enjoyed this one, and far more than Space Assassin, which really felt like a 'dungeon crawl' in space. The quasi-open-ended nature of the adventure really appealed, although Vera (?) Gross was a far more compelling and interesting villain than Blaster Babett. I always loved this adventure soley for the fact that I think it was the sole science-fiction adventure or story where money isn't described as 'credits'.